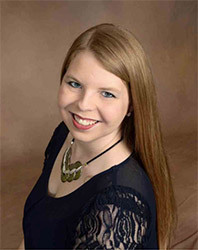 Abby Klemm, MT-BC, received her BM in Music Therapy from the University of Dayton. She completed her internship here at Music Therapy Services and then spent time in central Indiana working with children and adults with developmental disabilities and mental health needs. Abby co-authored a recent article in the Nordic Journal of Music Therapy regarding women’s perspectives of music therapy in a drug rehabilitation program. She has also completed unpublished research on the various connections made within a music therapy session. Abby enjoys presenting and has assisted with research presentations at the regional and national level. Recently, Abby presented on the effectiveness of music therapy at an intensive training for inclusive communication with individuals on the Autism spectrum. Abby is an active member of the American Music Therapy Association and Association of Ohio Music Therapists. Gardstrom, S., Klemm, A., Murphy, K. (2017). Women’s perceptions of the usefulness of group music therapy in addictions recovery. Nordic Journal of Music Therapy, 26(4), 338-358.